Something happened in the last ten years or so as exceptional drama TV programming moved away from traditional networks and onto pay cable systems like HBO. With shows like The Sopranos, The Wire, True Blood, Boardwalk Empire and Game of Thrones, HBO has established itself as one of the premiere destinations for those seeking well written, skillfully produced and high quality shows. A new show on HBO seeks to continue that tradition this weekend with the premiere of its new horse racing drama Luck. On first glance, it seems like Luck should have no problem taking its place with those other great shows. It was created and is being produced by David Milch (NYPD Blue, Deadwood) and Michael Mann (Miami Vice, Heat) and features an impressive cast including Dustin Hoffman, Nick Nolte and Dennis Farina. All of those elements together should warrant at least a look at the new show and will almost certainly lead to its success with fans. To help you get ready for the premiere, we’ve got a lot of videos to share with you today including some interviews with Milch and Mann as well as a couple trailers. Check out all the videos after the break. Luck premieres Sunday at 9/8C on HBO. When you think of quality drama on TV the network that probably comes to mind in HBO. With series like The Sopranos, Treme, Game of Thrones, True Blood and The Wire, HBO has and is the place where you can find some of the best shows anywhere. Now an upcoming series is hoping to take its place among those great shows. That series is Luck, which is a horse racing drama from producers Michael Mann and David Milch which features Dustin Hoffman and Nick Nolte. Over the weekend the network released a teaser trailer for the series and we, of course, have it for you right here. In it you’ll get a better idea of the show and how its all gonna go down. Gotta say, it looks pretty interesting. Plus, with the cast and creative team involved, it wil definitely be worth checking out. Luck is slated to premiere in January. Check out the preview after the break. The Thin Red Line (1998) marks the triumphant return of American film maker Terrence Malick’s return after a twenty year hiatus from the studio system. Anyone who was anyone in Hollywood circles jumped on the production of the film, even if it was just a brief walk on role. 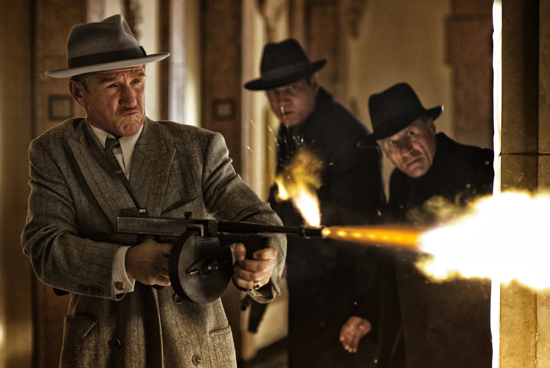 In fact, many A -list talents like Robert De Niro, Robert Duvall, Bill Pullman, Leonardo Dicaprio, Brad Pitt, Peter Berg, Dermot Mulroney, Edward Burns, William Baldwin, Edward Norton, Matthew McConaughey, Nicolas Cage, and Johnny Depp were very interested in joining the cast or were either cut from the film due to editing and budget constraints. Malick was best known for two films in the 1970s which were Badlands (1973) and Days of Heaven (1978) which were renowned for their breathtaking cinematography and for Malick’s ability to capture magnificent exterior shots much like John Ford’s sweeping westerns Stagecoach (1939), and The Searchers (1956). The beautiful cinematography of the film is credited to John Toll who is an absolute genius. Malick wrote the screenplay based on author James Jones 1962 novel which chronicles his experiences during the campaign. Pvt. Fife (Brody) is actually Jones who serves as the main character in the book, yet in the film is reduced to a minor character. The film stars some of Hollywood’s most celebrated actors such as Sean Penn (1st Sgt. Edward Welsh), Adrien Brody (Pvt. Geoffrey Fife), Jim Caviezel (Pvt. Robert Witt), Ben Chaplin (Pvt. John Bell), George Clooney (Capt. Charles Bosche), John Cusack (Capt. John Graff), John Savage (Sgt. McCron), John Travolta (Brig. Gen. Quintard), Arie Vereen (Pfc. Charlie Dale), Kirk Acevedo (Pvt. Tella), Mark Boone Junior (Pvt. Peale), Woody Harrelson (Sgt. Keck), Elias Koteas (Capt. James Staros), Tim Blake Nelson (Pvt. Tills), John C. Reilly (Sgt. Storm), and Nick Nolte (Lt. Col. Gordon Tall).